Have you ever had a recurring dream? And each time that dream revisits your slumber, some small detail has changed? It's the same dream, but it somehow feels unfamiliar again. 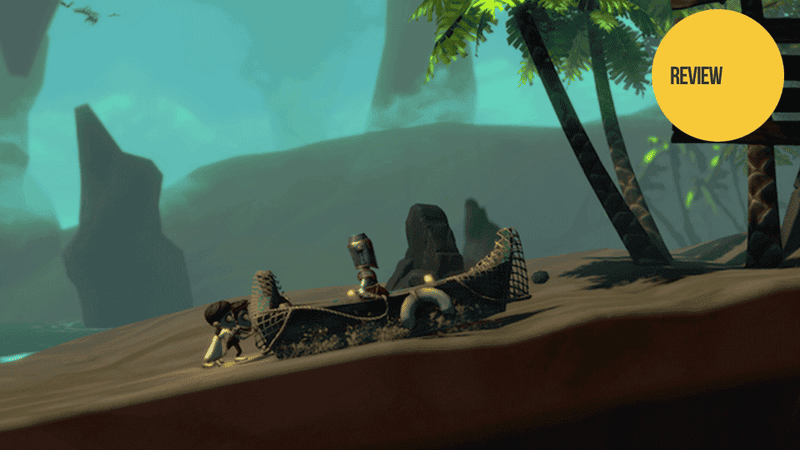 That's sort of what it feels like to play The Cave, Double Fine's latest cartoon-like adventure. You'll walk through the same hallways, climb the same ladders maybe ten, twenty times over. Eventually your fingers begin to carry themselves while your eyes dart across the screen for the minor details you missed. Looking for those small things that change with every path, both new and revisited. The Cave is made up of seven different stories, featuring seven different characters (including one set of twins). Depending on who you bring with you, you'll get to explore their respective, dedicated parts of the cave. In there you'll search for their one desired object. These areas are completely owned by the character. It's their domain, and their special abilities will come in most handy. But in each playthrough (which consists of a journey between three characters), there's a fixed beginning, a middle and an end. Those three components never change. They're the same story. And yet, who you bring on the journey still affects these sections, because how you go about completing them is what's different. Sure, without the scientist you'll never experience the nuclear lab, and without the hillbilly you'll never encounter the wacky carnival, but each character doesn't just have their unique level of the cave—they also all have different abilities. So, without the hillbilly you'll never be able to swim long lengths under water. Without the knight you'll never be able to survive a long drop down somewhere. These are the small details that make each pass feel new again, even if you're venturing through a level (from the beginning, middle or end) you just beat in a previous playthrough. Just like a dream, while most of that journey feels familiar, there's a hazy difference each time you play. WHY: Because it's a charismatic, challenging puzzle game that makes you want to prove to it that no, I'm not as dumb as you make me initially feel. What I played: Played through three times, with each character, which took roughly 11 hours. The voice acting, and in particular The Cave himself, who is as charming as he is diabolical. Getting stuck in some glitchy corners. Not a huge deal, though, because you can insta-kill yourself. Sporadic moments of slow pacing due to either the really obscure details that are easy to miss, or tedious back and forth treks required to set some solutions in motion. It's because of this structure that I wanted to play The Cave over and over again. I don't usually concern myself over the replayability of a game. Maybe it's because I'm expected to, as a reviewer and writer, play so damn many games that I just don't have the time for it. More often than not it's because I feel I've gotten a sufficient experience out of a game or even just its story. But The Cave has so many possibilities, so many small details. Sometimes I go to bed at night trying to recall memories of my favorite recurring dreams just so I'll experience them again once I lull myself to sleep. I want to see what's new this time around. The Cave inspires a similar desire in me. I want to replay to see how that character would deal with that one puzzle. What that character's level looks like. Figuring out how to achieve your specific goal in the cave—which, at its most basic form is getting from point A to point B—isn't as simple as it sounds. This is an adventure game, full of puzzles and even a few riddles. There's no such thing as just opening a door and stepping through to the next level. You'll have to use your three chosen characters' special abilities—abilities like underwater breathing, invincibility, telekinesis, grapple hook, hacking, ghosting, and wall-phasing—to interact with the world. You'll look for items and consider their uses. You'll think about how to combine items. You'll use a character's ability to access an item. The Cave is never complicated exactly. But it can be hard to miss the solution on first glance. You'll backtrack. You'll try to look at a problem from a new angle. You'll run through the inventory of items at your disposal. There was that bucket upstairs and a can of corn around the corner from here, what could they possibly do? What's the function of this barrel? For some, this might even be tedious. It could mean the difference between staying with the game or not, depending on your threshold for somewhat slower pacing. Occasional moments of unnecessary backtracking suggest that the puzzles could benefit from being tighter, as clever as they were regardless. I got stumped a few times on some really odd moments. And when I finally figured out the solution I felt like an idiot for not having spotted it beforehand. It's so simple! How could I have not seen it? It's easy to get caught up in elaborate scheming when a simple change in perspective is all that's needed. I got so stumped at one point—because there were two things I needed to notice in this one particular moment rather than the singular one I spotted—that I emailed creator Ron Gilbert himself for advice. Many "Ohhhhhh DUH" moments were had. The Cave isn't a puzzle game like Portal is. Portal makes you feel smart. Like you can accomplish anything. Like you should've been an astronaut cause your understanding of physics is just—look at that—so amazing. The Cave makes you feel kinda dumb, until you can actually master it. When a director of a film zooms in on a single shot, it's for a very specific purpose. It's their way of clueing you into some detail you should be noticing and paying attention to, because it'll be brought up again later. Similarly, every item and highlighted point of interest in The Cave has some use to you. A seemingly meaningless bag of dog food can mean the solution to your exit in this world. You're meant to look at these objects and consider what use they can be to each character's one desire. Every detail, every object, every line of dialogue and even every musical cue is there for a reason, and it's your job as the player to piece them together. It's one big puzzle piece, and as you unravel the secrets and string the pieces together, you'll discover mysterious, somewhat psychotic and often tongue-in-cheekish stories. But there's one unifying characteristic to every personality you can play as. Every one of these bastards is a selfish, opportunistic prick, concerned only with their objects of desire. Whether it's the twins who so desperately want to kill their parents with a box of rat poison, or the scientist whose greed for money makes her do unspeakable things, every last one of these guys and girls is awful. Their instinct is towards greed and apathy for anything but themselves. After a while, and after a few playthroughs I began to realize that these seven characters may even represent the seven deadly sins. Fitting, no? Greed, envy, pride, sloth, lust, wrath... the only one I couldn't appropriately place was gluttony, but I'm sure we can squeeze it in somewhere. Bottom line is that The Cave is very clearly making a social comment. I won't speak for the developers themselves—I asked Ron Gilbert about it and he sort of just gave a wink of an answer to my seven sins theory—but the game certainly feels like it's telling me something I already knew: that lots of people can be selfish. Lots of people are so driven for their goals that they lose sight of others. Or maybe it's a more insidery-related comment, about how video game heroes often cause so much destruction on their way to the finish line. Everyone is looking for something in this game. There's no altruism. No heroes. Not even really any villains. Just greed and, at best, misguided attempts at the pursuit of happiness. But that story—that lesson to learn—is a small part of what makes up this adventure game. It's a playful thought for you to chew on while otherwise occupied with the intricacies of shovels and dynamite. The Cave requires that you stop thinking like a gamer and start thinking in context of the characters you play as, and even the developers that made them. Puzzles aren't about character placement necessarily, timing, or precision. And while the puzzles are often simple in nature, they may not be as easy to spot. You'll have to get a hang of the patterns and the mentality behind certain items and how they fit within the context of each level. The Cave is all about items, their behaviors, and their potential combinations. I'd argue that the second playthrough is the best. Not just to see the other characters you have yet to play in their environments and to solve more puzzles, but also because you have a better grasp of the game. It's more enjoyable the second time around when it's a lot easier to overcome getting stumped on a particular clue. I got into a rhythm by my second pass, and I felt less like I was being played and more like I was doing the playing. I wasn't dumb anymore, I knew what sort of tricks this game had up its sleeve this time around. The Cave is a fairly simple adventure/puzzle game. It's cute, too. The narrator is sort of a goon who gets pleasure out of watching the cave spelunkers do their evil deeds. He's a little sadistic, as comforting and as jolly as his voice might deceive you to believe otherwise. In fact, The Cave himself might be the most villainous, greedy character of the entire game. Sure, I just tampered with a nuclear bomb and killed an adventurer just to cross a path, but The Cave watches and laughs. He creates the commentary. He's keeping the score. The feeling I'm left with after having played the game several times over is that I'm reminded by how much I love adventure games with clever puzzles. Because it reminds me that gamers can be smart problem-solvers. We can be resourceful and thoughtful. We can make the best of a situation. We can look at our set of tools and piece seemingly uncooperative items together to create something to our advantage. Even if all the while we're being taught a lesson about the narrow-viewed goal seeking we often take up when we pick up a controller.